The holidays are an exciting time full of many activities, and maintaining good oral care during them can be difficult. One typical activity is counting down to Christmas with an advent calendar. But advent calendars that focus on chocolate and sweets aren’t that great for children’s teeth. And the holidays in general can be bad for everyone’s teeth. This is why, at United Smiles we’ve come up with 4 ways to make your advent calendar a dental-smart one. As a bonus, we’ve tossed in 8 tips to make your holiday seasons a healthy and happy one for you, your loved ones, and their teeth! Story-A-Day – Nothing beats a good story. Pick out a holiday-themed book for every day of your countdown. Have your child open a new book each night at bedtime and read it together. Puzzles – Give your child a fun challenge with a customized puzzle. Draw a picture or write a special message on a blank puzzle. Break the pieces apart and place one puzzle piece in each day of your advent calendar. Holiday Activities- For each day of the month come up with a fun holiday activity that you can do together as a family. Write down the activity on a slip of paper and tuck one note into each day of your advent calendar. Sugar-Free Trinkets – Find some simple trinkets to fill each day on your calendar instead of candy. The dollar store is a great place to find fun items without spending a lot. 8 Bonus tips for friends, family, and YOU! Carol while you clean. Tooth brushing should last about two minutes so if you hum a few verses and choruses of your favorite holiday song while you brush, you’ll likely brush long enough to clean up your teeth and gums (be sure to brush your tongue too). Don’t eat like a cow. During the holidays, we often have spreads of food left out all the time. Grazing all day can put your teeth at greater risk for decay. Instead of leaving out things to nosh on, only put out food at mealtimes and then stash the food away. Have a routine. Santa’s elves always brush their teeth two times a day, for two minutes, and so should you! It’s what keeps your mouth healthy during the holidays and all year around. Make sure to use a toothpaste recommended by your dentist. Finally, don’t forget to floss daily, as it can reach areas of your mouth that even the best toothbrush will not clean. Follow your dentist’s oral hygiene instructions to make sure that your teeth stays clean and healthy. Don’t forget the dentist!The holidays can be a busy time, but that doesn’t mean you can forget about your teeth. If you are due for a teeth cleaning or need work done, don’t forget to visit your United Smiles dentist in December for your regular examinations. Drink water. You need a lot of energy for holiday activities, but avoid drinking sodas, sports drinks and juices with lots of sugar. Instead, drink water with fluoride in it to keep your teeth strong and healthy. Be attentive to sugary sweets. In many families, the holidays are filled with gut-busting dinners and sweet desserts. Stockings are stuffed with candies, bubble gum, and other sugary confections. Enjoying these treats can certainly play a role in enjoyment of the holidays. But, it is important to keep in mind how much sugary food you consume during your holidays and to brush and floss after eating them. By paying attention to how much sugar you eat this holiday, your teeth will be healthier and you won’t have to work as hard on the treadmill after you make your New Year’s Resolutions! Stay away from soda. Holiday parties are afloat in soda and this sugary substance is never good for your teeth. If you want something bubbly, try fizzy water rather than soda. If you must drink soda, use a straw to keep most of the acid off your teeth. United Smiles is conveniently located in the heart of Mernda Village, serving patients of all ages. Our office has ample parking at the rear of the building. Wheelchair access is also available at the front of the building. Make the holidays count for your dental health. United Smiles is your partner in keeping your pearly whites bright and healthy this Holiday season. 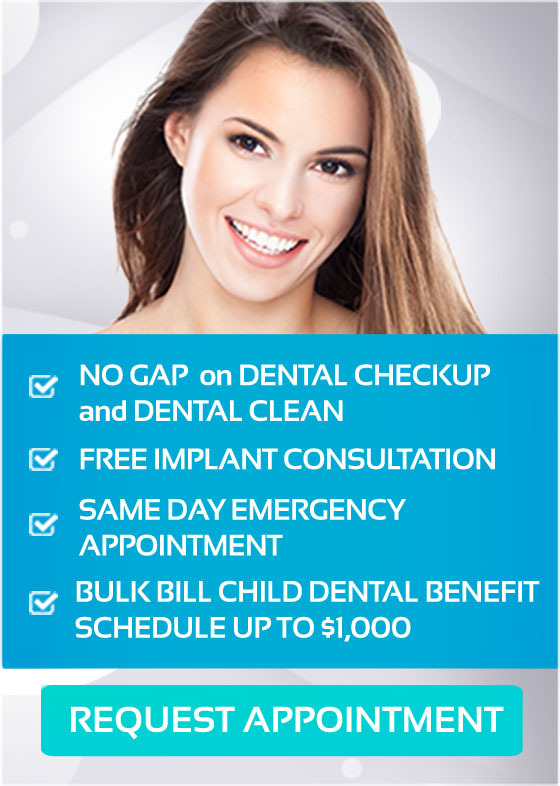 NO GAP on DENTAL CHECKUP and CLEAN for Medibank Private, HCF and CBHS. Call us on (03) 8682 8658 or request your appointment online today!